As only he can, Alex Rodriguez outraged Oakland pitcher Dallas Braden last week by running over the pitcher's mound on his way back to first base after a foul ball. What a cad. Next thing you know, he'll take off his shirt in Central Park again. I'm not sure who was more out of line, though. Was it A-Rod for again being rather clueless about another of the game's unwritten rules? "I'd never quite heard of that," he claimed, while also questioning whether a pitcher with 17 career victories has sufficient credibility to criticize him. Or was it Braden for going to DEFCON 2 over such a minor breach of baseball etiquette that not everyone is entirely sure it was a breach? "This is my mound, my rubber!" Braden insisted, adding that he would have yelled at his grandmother if she had tried the same thing. 1. Once when an opposing pitcher had a no-hitter going against the Yankees, A-Rod walked into the visitors dugout, sat down right next to the pitcher and said, "Hey, do you realize you haven't given up a hit yet?" 3. When the Yankees visited the White House this week, Rodriguez greeted President Barack Obama by telling him to "Pull my finger." 4. One hot, sunny summer day, he took off his shirt in Central Park. And then his pants. And his underwear. 5. Last year, A-Rod went to dinner at an expensive restaurant with Brett Gardner, Shelley Duncan and David Robertson, then suggested they split the bill equally four ways even though his share should have been more because he ordered an appetizer and a second glass of wine. 6. In an interleague game at Shea Stadium, he told Lady Met that her outfit made her look fat. 7. In a recent game in which Joe West was the plate umpire, A-Rod repeatedly stepped out of the box to check his e-mail and text friends between pitches. 8. He once tried slapping a foul ball out of the glove of a 12-year-old fan who had just caught it in the stands. 9. When a Yankee hit an easy popup to the Toronto third baseman with two out and A-Rod on second base, Rodriguez yelled behind him, "Quick, check it out! Jessica Alba is flashing her breasts behind the dugout!" 10. Worst of all: A-Rod occasionally forgets and wears the garter belt with the rose in the back. 1. Braden has begun charging rent and requiring advance nonrefundable reservations to use the mound in Oakland. Worse, he doesn't offer a rewards program. 2. When manager Bob Geren and catcher Kurt Suzuki visited the mound recently, Braden called the cops and had them arrested for trespassing. 3. The next day, Braden ordered the installation of an invisible dog fence around the mound. 4. When the Athletics are on the road, Braden tries to mark his territory by urinating on mounds in the other stadiums. 5. On team flights, he immediately reclines his seat all the way back, smashing into the laptop of the guy behind him and leaving him no room at all to work or eat. 6. When his grandmother visited him on his birthday last year, he shouted, "What the f--- are you doing in my house?" and had her picked up for loitering. 7. When he joined the Athletics, Braden cordoned off his locker with police tape, then told his teammates that if he caught any of them touching his stuff, or even looking at his stuff, he would kill them. He also warned that if anyone called him Francis, he would kill him. 8. This season, he insisted the Athletics give him a desirable locker next to a wall even though he has a career losing record. 9. He greeted trick-or-treaters this past Halloween by spraying them with a garden hose and ordering them to "Get the f--- off my property." 10. Worst of all, he hasn't paid county real estate taxes on his mound since 2007. New York's Raul Valdes had a line you almost never see -- 0 IP, 0 H, 0 R, 0 ER, 0 BB, 0 K -- thanks to throwing one pitch in the top of the sixth inning before Sunday's Mets-Atlanta game was ended by rain. Meanwhile, for Double-A Harrisburg, Stephen Strasburg pitched five hitless innings (5 IP, 0 H, 0 R, 0 ER, 6 K) and singled in the game's only run to improve his record to 3-0 with an ERA of 0.52 and keep his batting average at .333. ESPN.com ... who also happened to leave the game to fight in a civil war. Piniella says he made the switch because he needed someone dependable to help in the bullpen. That's understandable, but the general problem facing teams these days is their outright refusal to use their "closer" in anything other than a ninth-inning save situation, as well as a trend that has turned most other relievers into one-inning specialists. For instance, the Mariners are being hampered by an extremely thin bench, which is the result of carrying two DHs (Ken Griffey Jr. and Mike Sweeney) and seven relievers. Seattle opened the season with six relievers, but manager Don Wakamatsu quickly decided he needed seven. The problem, however, wasn't a lack of relievers but a preponderance of specialists who rarely are required to pitch more than one inning and thus can quickly leave a team feeling short-handed. At last glance, the Mariners have used relievers 47 times, but on only seven occasions did they use them to retire more than four batters. They are far from alone. Yes, with starters pitching fewer innings, more relievers are needed. And yes, having set roles can be effective and make relievers feel comfortable, but that comes at a price. By increasingly limiting when and how relievers can be used, teams are handicapping their rosters. It wasn't that long ago teams got by with 10- and 11-man staffs. Now they feel they need at least 12. And if this trend continues, 13 pitchers (which some teams have already used) will become the norm. And it still won't be enough. Here's the deal. 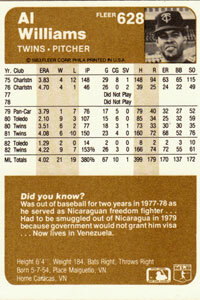 Each week, Off-Base prints a fragment of an old box score, then asks you to explain its historical significance. Here's this week's fragment. Difficulty rating: 3. ANSWER: The significance of this box score is that it is not a misprint; the White Sox really did use closer Goose Gossage for 7 1/3 innings in this game in 1975. He took over with Chicago trailing 3-2 in the fifth, two out and runners on first and third. In other words, it was an important situation to keep the game close, so the White Sox went with their best reliever. What a concept. Goose got out of the inning with no further damage and pitched seven scoreless innings to win in 12. Gossage was 9-8 with 26 saves and a 1.84 ERA that season. 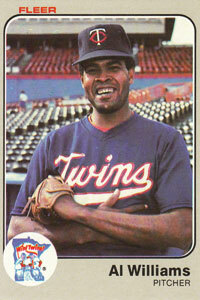 He pitched 141 1/3 innings in 62 games, making 17 appearances in which he recorded at least 10 outs. Did all that work hurt him? I don't think so, given that he pitched another 19 seasons. • Last week's "Stadiums, Ballparks and Drives" video showed the Twins' great Minnie and Paul logo, which is now the wonderful focal point of the team's new park. What I didn't realize at the time -- and as an alert reader pointed out -- is that the man who drew the logo, illustrator Ray Barton, had died just days earlier at age 80. Barton drew the logo for $15 when the Twins moved to Minnesota, which ranks with the $35 Carolyn Davidson received for designing the Nike swoosh. • Here's something you don't see every day, even in the first month of the season. Atlanta beat Philadelphia last week to move into first place. The next day, the Braves lost and fell into second place. The next day, they lost and fell into third place. The next day, they lost and fell into fourth place. The next day, they lost and fell into fifth place. First to last in five days, with a stop in each place. • Check out this page for a nice tribute to Bob Sheppard.